Fever remains the most common concern prompting parents to present their child to the emergency department. Fever has traditionally been defined as a rectal temperature over 100.4 F or 38 C. Temperatures measured at other body sites are usually lower. 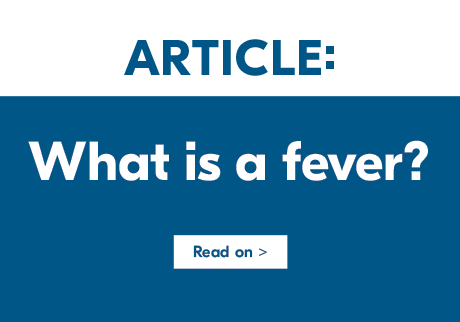 The threshold for defining a fever does vary significantly among different individuals, since body temperatures can vary by as much as 1 F. Low-grade fevers are usually considered less than 102.2 F (39 C). Fever itself is not life-threatening unless it is extremely and persistently high, such as greater than 107 F (41.6 C) when measured rectally. Risk factors for worrisome fevers include age under 2 years (infants and toddlers) or recurrent fevers lasting more than one week. Fever may indicate the presence of a serious illness, but usually a fever is caused by a common infection. However, many conditions other than infections may cause a fever. Call a child's doctor if any of the following are present with fever. The child is younger than 6 months of age (regardless of prematurity). One is unable to control the fever. One suspects a child may become dehydrated from vomiting, diarrhea, or not drinking (for example, the child has sunken eyes, dry diapers, tented skin, cannot be roused, etc.). The child has been to a doctor but is now getting worse or new symptoms or signs have developed. When giving fever medication follow the dosage and frequency instructions printed on the label. Please consult your pharmacist or doctor before giving a dose. Do not use aspirin to treat fever in children, especially for a fever with chickenpox or other viral infection. Aspirin has been linked to liver failure in some children. A sponge bath in warm water will help reduce a fever. Children should not be overdressed indoors, even in winter. Chiappini, E., N. Principi, R. Longhi, P.A. Tovo, P. Becherucci, F. Bonsignori, et al. "Management of Fever in Children: Summary of the Italian Pediatric Society Guidelines." Clin Ther 31 (2009): 1826-1843. Enarson MC, Ali S, Vandermeer B, Wright RB, Klassen TP, Spiers JA. Beliefs and expectations of Canadian parents who bring febrile children for medical care. Pediatrics. 2012 Oct 1;130(4):e905-12. Pierce, C.A., and B. Voss. "Efficacy and Safety of Ibuprofen and Acetaminophen in Children and Adults: A Meta-analysis and Qualitative Review." Ann Pharmacother44 (2010): 489-506. Sullivan JE, Farrar HC. Fever and antipyretic use in children. Pediatrics. 2011 Mar 1;127(3):580-7. Tolan Jr., R.W. "Fever of Unknown Origin: A Diagnostic Approach to This Vexing Problem." Clin Pediatr (Phila) 49 (2010): 207-213.